John Joseph Steward fought in the Great War, from the Battle of the Somme to the final offensives of 1918, and he was an acute, unflinching observer of the conflict he took part in - of life and death on the Western Front. He was a writer, too. He recorded his experiences in accurate detail and later in life he wrote a graphic fictionalized account of his wartime career - the story of his war, his comrades and his platoon. His narrative is published here for the first time, edited, annotated and with an introduction by Andrew Robertshaw and Steve Roberts. Their research into Steward’s story is a fascinating example of how such work can be used to give a vivid insight into the experiences of a Great War ancestor. Andrew Robertshaw is Curator/Manager of The Royal Logistic Corps Museum in Deepcut, Surrey. For the past twelve years he has been coordinating a group conducting an archaeological dig of British trenches and other sites on the Somme. He frequently appears on television as a commentator on battlefield archaeology and the soldier in history. 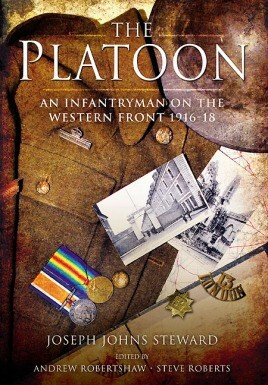 His publications include A Soldier’s Life, The Somme 1st July 1916, Digging the Trenches (with David Kenyon) and Ghosts of the Somme (with Alastair Fraser and Steve Roberts). Andrew Robertshaw is an author and a historian.